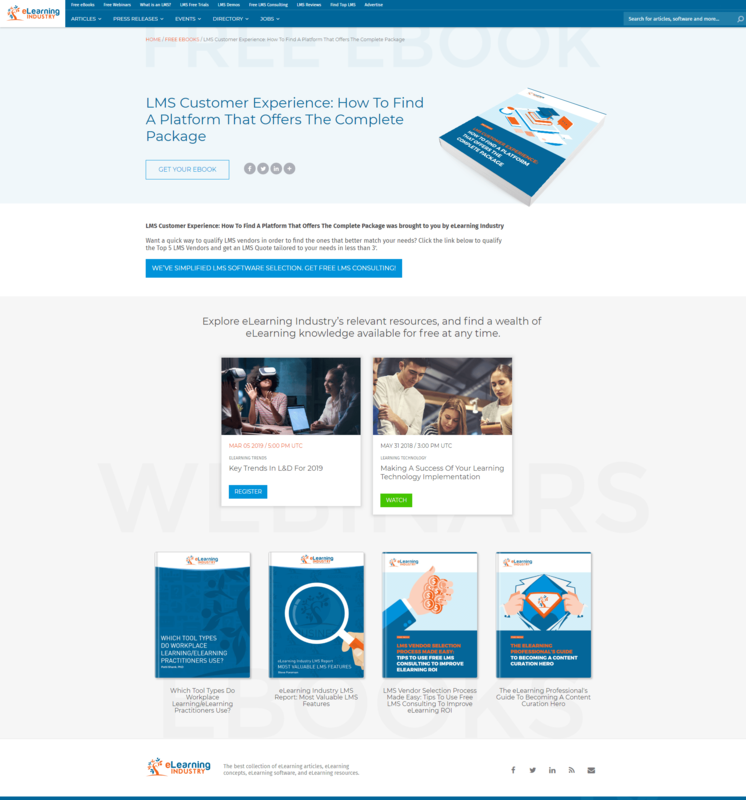 Publish your eBook (at least 5,000 words and suitable for the eLearning audience ) on eLearning Industry and transform it into a lead-generation machine, easily and quickly. Our team will help you republish your gated asset, create several supporting articles based on the content of the eBook and promote them all effectively across the largest network of eLearning decision makers. Minimum effort is required, as you only need to send us the PDF file and fill in the campaign form. Let us do the rest! Get the most out of your existing eBook with minimal effort. Let our team plan and execute a promo campaign for your eBook. Generate net-new leads on a monthly basis with eLearning Industry’s audience. Introduce your expertise to a new and highly qualified audience. Our editorial team will review your existing eBook to ensure it’s suitable for publication (5.000 words min. and suitable for eLearning Industry audience). You just need to fill out the intake form for the eBook. 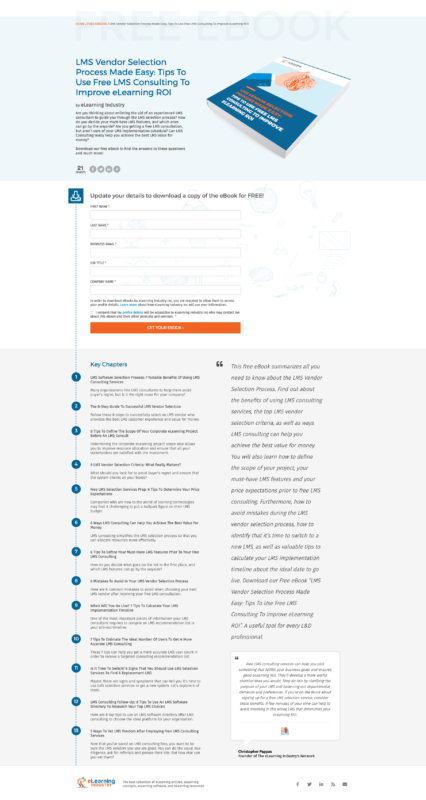 We create the landing page according to the info of the eBook submitted to the intake form. We produce an intro article that will highlight the benefits of your eBook, signed by our founder, Christopher Pappas. We will repurpose the content of your eBook and turn it into a series of customized articles in order to increase exposure and attract more readers to the landing page of your eBook. Our Digital Marketing team will promote your eBook and its supportive articles through our newsletters, and social media channels. We will keep you in the loop regarding any updates via Asana. There, you can follow the campaign process of your eBook, step by step. You will have 24/7 access to the leads that have registered to your webinar for 6 months, starting from the selected publication date. Important Note: Please note that you must fill out the eBook Intake Form eight (8) business days prior to the selected date in order to have it published on your chosen date! Your campaign will start counting directly after we create the eBook’s landing page on eLearning Industry and it’s valid for 6 months. Since the 6-month period is passed your subscription will be automatically updated for 6 more months for the cost of $1200, except you have already canceled your subscription.